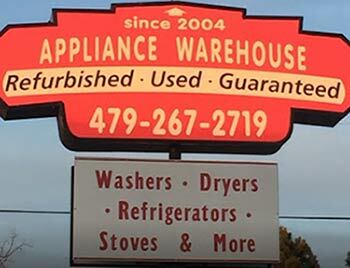 Appliance Warehouse has been a family-owned and -operated business since 2004. We are a full-service, used appliance store that provides parts and repair services. We can diagnose your appliance, repair it and breathe new life into it! We specialize refurbishing appliances, so we know how to fix it the first time. Need to replace an appliance in your home, but don’t have the funds to afford a brand new, top of the line unit? Don’t worry: Appliance Warehouse is here to help! As the premier dealer of refurbished and used appliances in Washington County, AR, we take pride in bringing our customers gently-used appliances, at prices they can afford—all with the functionality and lifespan they need for complete peace of mind. We know that your fridge, washing machine and range are all important parts of your everyday life, which is why we make it a point to help you get the most out of these appliances. We’re licensed, with Universal EPA Certification. We offer delivery of repaired appliances and can also come to you for service calls. Our techs can work on all major appliances. We offer a full inventory of used and refurbished appliances, at affordable prices. If you’ve got an appliance that’s not functioning properly or need a professionals to evaluate your appliance for repairs or service, get in touch with us today!